I had a requirement from the customer to have all incoming calls come in to an AA during business hours, and after hours have all calls routed out to an answering service. So, I had to do some re-work on this, but what I ultimately did was to create a route-point in ShoreTel Director and during 'on hours', I had all calls forward to my AA. On the 'off-hours' tab, I selected an internal extension (116). 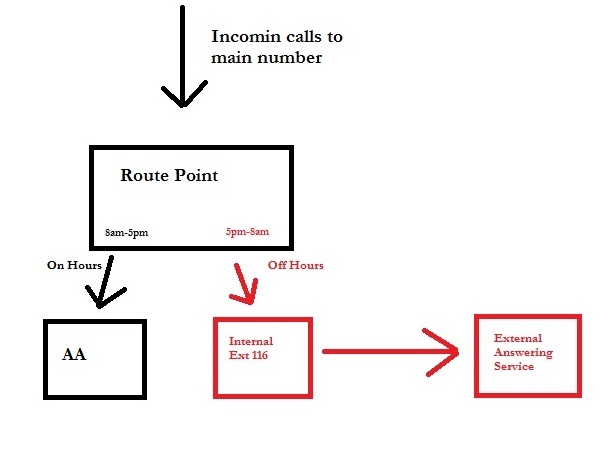 That internal extension (116) I had set up to forward all calls to an external phone number (answering service). It cost me a license, but that was ok in this situation. Why waste a license? Route points can also forward to an external extension following a schedule - I'm doing this currently to accomplish exactly what you've described..